Most of us got no time for minor utility problems so we never deal with them ourselves, instead, we hire professionals to fix them for us. Do we always have to do that? Do we always have to rely on others to fix our mess? No! We are intellectual beings therefore; we look for possible ways to fix the problems that we are facing. 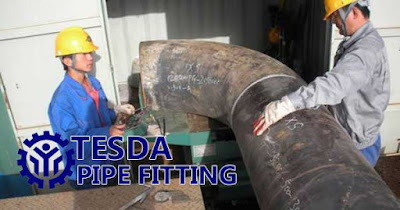 If you’re one of those people who would want to try something new for themselves or are curious of what they can do regarding the said matter, you are pretty much welcome to check one of the courses of TESDA: Pipefitting NC II. Pipefitting or pipefitter course may help us know things about installing, assembling, fabricating, maintaining and repairing piping systems. It is a very high-leveled profession which requires to be licensed as seen in other countries. More often, pipes can get disturbing, especially when they break, thus, we must know how to fix them, not necessarily everything but at least even a bit to lessen the Pipefitter’s job. Nevertheless, their work does not end in fixing pipes alone as they can also assemble them and then install them, fabricate and repair, troubleshoot, lubricate and other processes in Pipefitting. If you are interested in learning skills in terms of Pipefitting, then this course suits your interest best and you might become one of the few Pipefitters in your area. That could both be satisfying and rewarding at the same time. This course can be completed in at least 202 hours of sessions. Once you graduate Pipefitting NC II, you are now qualified to apply or be employed as a Pipefitter. There are numerous jobs abroad that hire pipefitter. Students who are enrolled in the Pipefitting NC II course may be obligated to go through a Competency Assessment before graduation. This is to ensure the issuance of National Certificates (NC II) that will be given to students once they pass the assessment. You may find more information regarding the assessments and certifications on this page.